Architect IBM (R) WebSphere (R) Applications for Maximum Performance, Security, Flexibility, Usability, and Value Successful, high-value WebSphere applications begin with effective architecture. Now, one of IBM's leading WebSphere and WebSphere Portal architects offers a hands-on, best-practice guide to every facet of defining, planning, and implementing WebSphere application architectures. Joey Bernal shows working architects and teams how to define layered architectural standards that can be used across the entire organization, improving application quality without compromising flexibility. 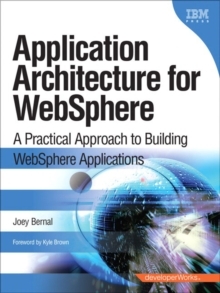 Bernal begins by illuminating the role of architecture and the responsibilities of the architect in WebSphere applications and SOA environments. Next, he introduces specific architectural techniques for addressing persistence, application performance, security, functionality, user interaction, and much more. Bernal presents a series of sample architectures drawn from his work with several leading organizations, demonstrating how architectures can evolve to support new layers and changing business requirements. Throughout, his techniques are specific enough to address realistic enterprise challenges, while still sufficiently high-level to be useful in diverse and heterogeneous environments. Coverage includes* Choosing persistence frameworks that serve business requirements without excessive complexity* Avoiding persistence-related problems with performance, security, or application functionality* Designing and deploying effective middle layers and dependent libraries within WebSphere Application Server* Using WebSphere mechanisms and architectural techniques to avoid common security attacks such as SQL injection* Improving performance with WebSphere Application Server caching, including Distributed Maps and Servlet/JSP fragment caching* Using presentation frameworks to provide fast, robust, and attractive user interaction* Incorporating portals that provide a standardized framework for merging multiple applicationsJoey Bernal is an Executive IT Specialist with IBM Software Services for Lotus. Senior Certified with IBM as an IT Specialist, he has an extensive background in designing and developing Web and Portal Applications. He often leads IBM teams that have assisted dozens of clients in leveraging WebSphere Portal to address architecture, design, and implementation challenges. 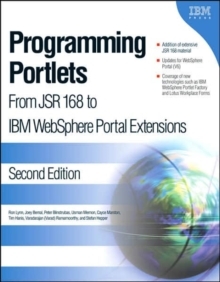 A frequent speaker on WebSphere and portal topics, Bernal is coauthor of Programming Portlets, and hosts the developerWorks blog: WebSphere Portal in Action. Prior to joining IBM, he was Director of IT for an incentive and performance improvement company, and served as lead technical advisor and architect for high-profile Internet and intranet applications at several Fortune 500 companies. You can also visit the author's Web site at www.bernal.net. The IBM Press developerWorks (R) Series is a unique undertaking in which print books and the Web are mutually supportive. 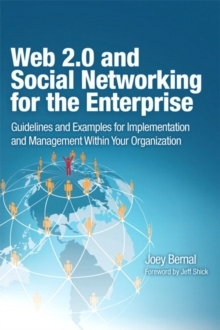 The publications in this series are complemented by resources on the developerWorks Web site on ibm.com (R). Icons throughout the book alert the reader to these valuable resources.